Day 25 a tale of two rides. Tale of the first ride. Day 25 started out at the top of the bell about 4600 feet and quickly began to descent rapidly. 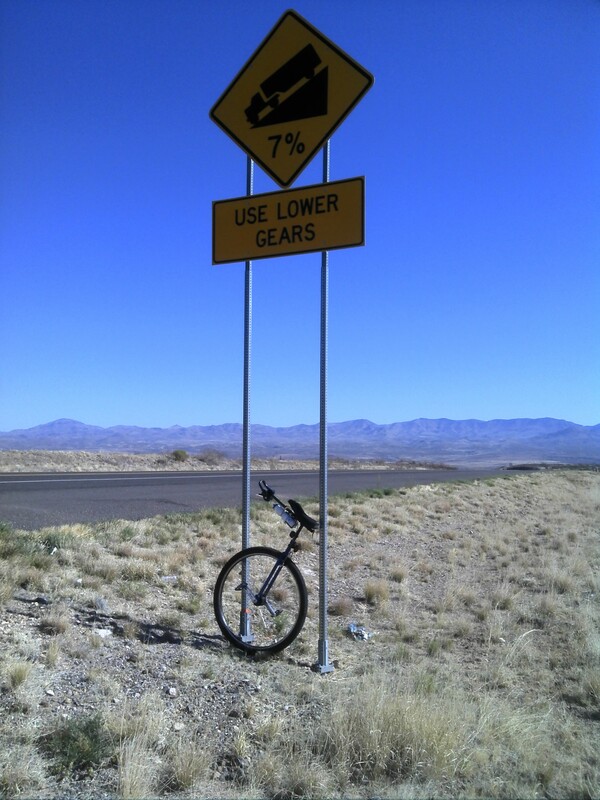 The sign said 7% grade use low gear. So I did. I was inching down in low using by brake when the camber of the road shifted so I went to switch hands on the brake. When I switched hands on the break I squeezed a little too hard and started to pitch forward. My reaction was to let off the break, but my legs couldn’t quite hold me back. First my right leg came off the pedal, then my left joined the right. So this is what it feels like to coast on a unicycle. The feeling however was short lived, and in a bit of a dynamic UPD the unicycle and I parted company. The unicycle went ahead without me, and I landed on my back. Thank goodness my camelbac was full and quite effectively cushend my landing. A semi was coming down the hill had a first row seat of the action. He slowed down the check me out, but I gathered my uni and my cycle meter that landed out in the road and waved him on. The right pedal scraped my leg a little, but my ego was probably bruised the most. I made it to the bottom of the bell and patched myself up and continued up the next bell. The Tale of the second ride. I was now headed from an elevation of about 3500 feet to ride to the top of the second bell at 6200 feet. Route 78 was relatively smooth but had narrow to nonexistent shoulders. Fortunately I encounter the least traffic on the trip so far. It appears no vehicles like climbing this pass. I pedaled along slogging my way up the switch backs in low gear on the KH 36, thinking may I should try the Schlumpf 29. My crew and I leapfrogged up the hill. I pedaled and she played paparazzi. With about 500 more feet of elevation to climb, I wimped out and finished the climb on the 29” in low gear. This was the most climbing of done to date and my legs feel like toast from the past two days. When will I get in shape? I called it quits after 26 miles. I think that night staying at the Motel 6 did make me soft. Last night I felt a little bit like I was camping on the Middle Fork of the Salmon River. I could hear the gurgling of the San Francisco River running by the camp and we were nestled in a bit of a canyon in Clifton. 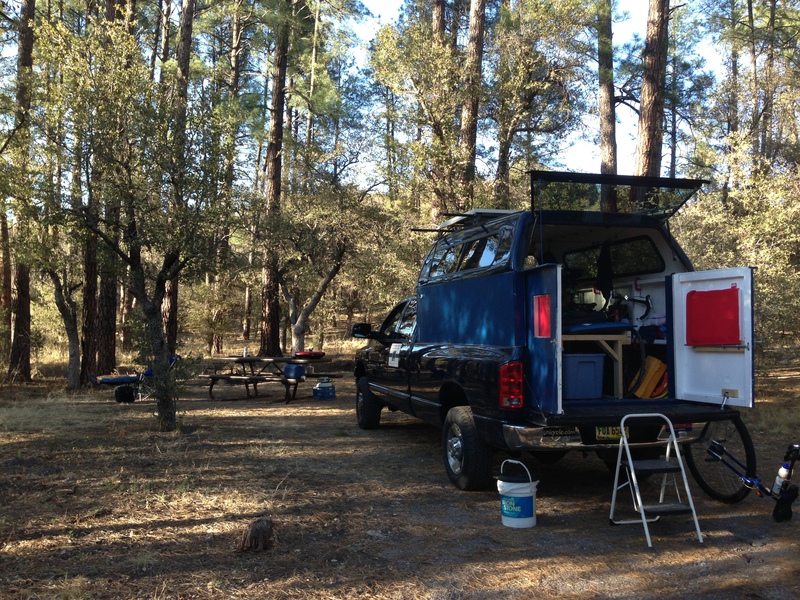 Tonight again we could be on a different section camping at nearly 6000 feet nestled among Ponderosa Pines. Stats for day 25: Rode 26 miles at 7.6 mph, Max=13.3 mph, Ascent=2904′, Descent=1991′, Ave heart rate=111, Max heart rate=148, Min elevation=3518′, Max elevation=6252, Ave temp=72, Calories burned 1201. Day 26 Welcome to New Mexico Coldest day to date. It was 34 degrees when I was getting ready to ride. I was wrapped up like a Christmas ham but looked more like a turkey. I wore my helmet liner and covered my helmet with my Goretex shell. On my torso I donned my cycle jersey, long sleeve pile, and windbreaker. I wore bike gloves with a liner, and bike shorts under long cycling pants. It’s no wonder I could barely make it up the first hill. After riding a 1.25 miles I crossed into New Mexico. Within 5 miles I shed the long pants, and substituted the pile top with a light weight long sleeve shirt under the windbreaker. Route 78 descended but with rolling hills and challenging head and cross winds so it was low gear on the KH for the first 15 miles. My legs felt like mush. At 16 miles I turned right onto route 180 and proceeded to buck head winds and crosswinds. It didn’t seem to matter which direction the road turned. Then 180 nearly flattened out and I pushed high gear against a head wind for the next 15 miles. My paparazzi crew played leap frog and took more pictures. I hated to call it quits after 32 miles with such nice road, but yesterday’s climb and today’s winds just beat me up. I know, I know I’m a wimp. Stats for Day 26: Rode 32.2 miles at 9.0 mph, Max=13.5 mph, Ave heart rate=110, Max heart rate was off the chart due to radio interference. Ascent=1102′, Descent=2146′, Max elevation=5880′, Min elevation=4528′, Ave temp=66, Calories burned=1112. 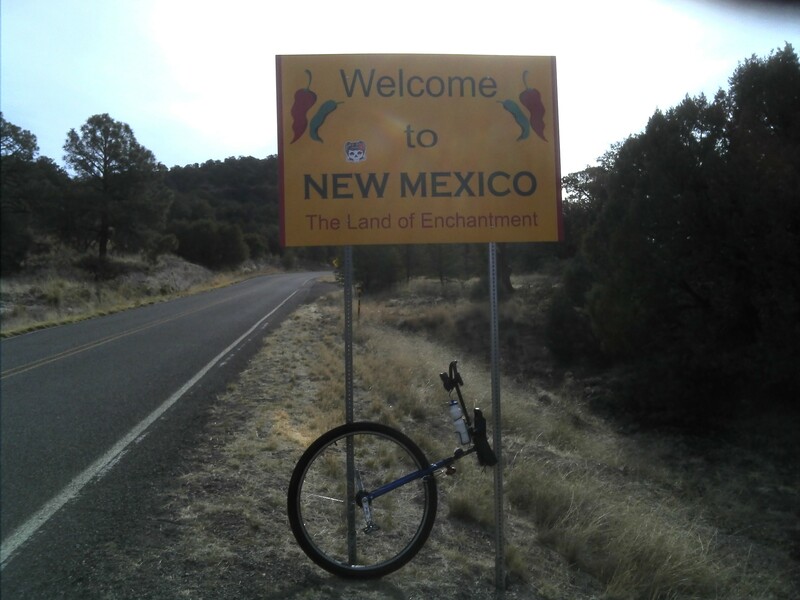 After riding 1.25 miles I crossed into New Mexico. Ye ha!! I heeded your warning and did not read the “fall” paragraph. Kept my eyes closed the whole time. I think maybe its time for a reward for you and your trip and boost up that red line at ALS. Joan’s pictures as usual are fabulous. I’m wondering where she may have climbed to get some of those shots. I clicked on them and the full screen was awesome. Snow today. Stay safe. I admire you, David. Stay strong and safe. You were so descriptive, I think I got clammy hands and feet just reading about it! i was glad i had just heard the story from joan before i read the discription. if it makes you feel any better i had a similar experience, but in my case, i tripped on the side walk while running. my little gps flew into the street. not nearly as dramatic. very very humiliating.